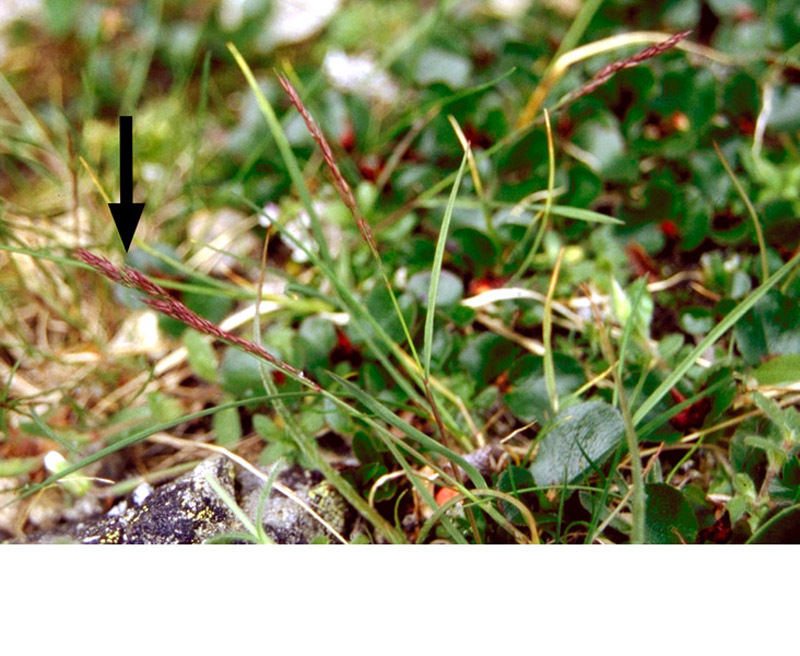 Flora of the Canadian Arctic Archipelago - Agrostis mertensii Trin. Published in Linnaea 10: 302. 1836. Type: Alaska: Aleutian Islands, "in insula Unalaschka", 1829, leg. Mertens, selected by Widén 1971. Lectotype: LE TRIN-1622.01, plant 1. Mertens s.n, "in insula Unalaschka" (U.S.A.: Alaska: Unalaska. 1829). Lectotype, selected by A.S. Hitchcock (1905). Synonymy. Agrostis borealis Hartman, Scand. Fl. ed. 3. 17. 1838. Type: (Mountains in wet places, Sweden, Lapland). Agrostis bakeri Rydberg, Bull. Torrey Bot. Club 36: 532. 1909. Agrostis borealis var. bakeri (Rydberg) Ito, Journ. Geobot. 9: 68. 1961. Type: Colorado: near Pagosa Peak, C.F. Baker 150, Aug. 1899. Vegetative morphology. Plants (5–)7.5–36(–50) cm high; perennial herbs; caespitose. Only fibrous roots present. Ground level or underground stems absent. Aerial stems erect. Leaves mainly basal; alternate; marcescent. Prophylls 4–6 mm long; with smooth veins; lacking pronounced keels. Petioles absent. Sheaths present; with the margins fused only in the lower part; glabrous; sheath collars present. Ligules present; 1.2–2(–4) mm long; membranous; glabrous; ovate-oblong, or transversely oblong. Ligule apices obtuse, or truncate; erose. Leaves grass-like. Blades 25–60(–120) mm long, 1–2(–5) mm wide (when flat), appressed to the stem or spreading, rolled in bud, linear, flat or involute, veins parallel, midvein similar in size to other veins in the leaf. Blade adaxial surface glabrous. Blade abaxial surface glabrous. Reproductive morphology. Flowering stems circular or oval in cross section. Flowering stems culm nodes becoming exposed; number visible 0–1. Inflorescences paniculate; diffuse; linear (preanthesis), or pyramidal; 2–6.5(–10) cm long; 15–42 mm wide. Inflorescences main axis glabrous. Number of inflorescence branches at lowest node (1–)2–4(–5). Inflorescence primary branches 10–40 mm long; glabrous; with spreading secondary branches. Spikelets disarticulating above the glumes; ovate; 2.2–3(–3.5) mm long; 0.7–1.2 mm wide. Florets per spikelet 1. Two glumes present (equal in length.). First glume 1–1.1 × the length of the second glume; 1–1.1 × spikelet length; 2.2–2.8 mm long; lanceolate; with trichomes (on the vein); margins glabrous (sometimes sparsely scaberulous); veins 1; apex acute. Second glume as long or longer than the spikelet; almost as long as, or longer than, the lowest floret; 2.2–2.8 mm long. Second glume lanceolate. Second glume glabrous; veins 0–1. Callus differentiated (slightly); hairs 0.1 mm long (approximately); hairs shorter than the floret. Lemma ovate; 2–2.6 mm long; rounded on the back; surface dull; surface sparsely scabrous; surface with trichomes on veins only; veins 1 (with short excurrent marginal veins); apex acute; apex entire, or erose; apex glabrous; awned. Awn arising from below the apex but above the middle (slightly above), or from the middle or below. Awn 2–2.5(–4) mm long. Palea vestigial; 0.2–0.5 mm long; veins glabrous, or scabrous, or hairy. Flowers bilaterally symmetrical (zygomorphic); bisexual. Perianth represented by lodicules. Stamens 3. Anthers splitting longitudinally. Anthers 0.5–0.8 mm long. Ovary superior; carpels 3; syncarpous. Ovaries glabrous. Styles 2. Placentation basal. Ovules per ovary 1. Fruit sessile; dry; a caryopsis; 1.3–1.7 mm long; indehiscent. Seeds 1. Chromosome information. 2n = 56. 2n (8x) = 56. Böcher and Larsen (1950, Greenland); Björkman (1951, 1954a, b, northern Europe); Sokolovskaya (1955, 1962, 1963, northeastern Asia, Kamtch; 1965, 1970, northeastern Russia); Jørgensen et al. (1958, Greenland); Bowden (1960b); Sokolovskaya and Strelkova (1960, 1962); Löve and Löve (1966b, northeastern USA); Löve (1981a, central Canada); Hedberg (1967, northern Canada); Engelskjøn and Knaben (1971, Norway); Widên (1971, northeastern Scandinavia); Probatova (1979, northeastern Asia, Kamtch); Dalgaard (1989, western Greenland). Numerous more southern counts. Taxon as an environmental indicator. This species is indicative of a warmer, southern arctic habitat and an early stage of succession, as the plants are small, delicate, and easily outcompeted by more robust species. Ecology and habitat. Substrates: hummocks, slopes; dry, moderately well-drained areas; rocks, till, moss; acidic. In dry, rocky, and turfy places on acidic rocks mainly in the Precambrian shield area. North American distribution. In the eastern Canadian Arctic Archipelago, this species is limited to southern Baffin Island. Alaska, Yukon, continental Northwest Territories, Nunavut Islands, continental Nunavut, northern Quebec, Labrador. Range in the Canadian Arctic Archipelago limited. Uncommon. Low Arctic. Arctic islands: Baffin. Northern hemisphere distribution. Circumpolar, or circumboreal (alpine-arctic with large gaps, esp. in N Asia). Northern Fennoscandian, KaninPechora, Polar Ural  Novaya Zemlya, YamalGydan, West Alaska, North Alaska  Yukon, Central Canada, Labrador  Hudson Bay, West Greenland, East Greenland. General notes. The name A. borealis was published in 1838, and used by many authors, including Hitchcock (1905) and Porsild (1964). However, the name A. mertensii had been applied to the same taxon since 1836. In the protologue of A. mertensii by Trinius in 1836, the name is given as "Agrostis Mertensii Herb. Acad. Petrop." and the localities of the species cited as "In And. Chil. austr. (Eandem legit b. Mertens in Unalaschka)". The epithet and the method of citation suggest that Trinius was basing the description primarily on Mertens's Alaskan specimen, which was designated as "the type specimen" by A.S. Hitchcock (1905). This is to be regarded as a lectotype [following Art. 9.8 of the Tokyo Code Greuter, McNeill, et al. 1994]. 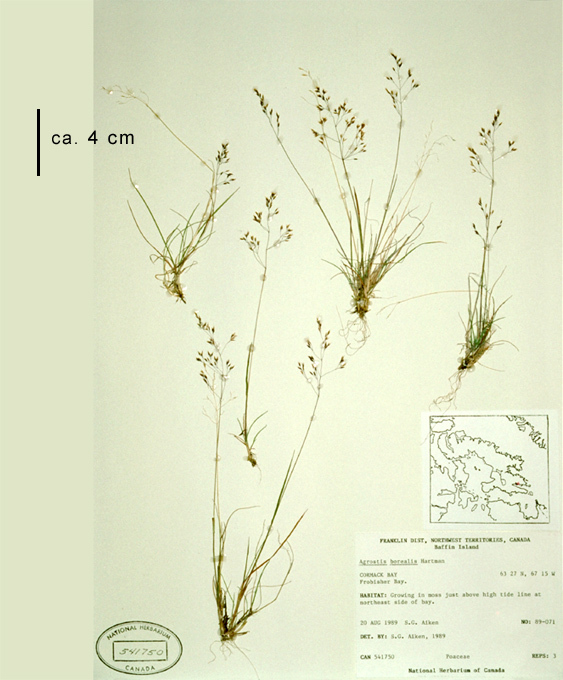 Agrostis mertensii was also published by Trinius in Agrostol. 2: 85 (1841), a preprint from Mém. Acad. St. Petersb. ser. 6 Sci. Nat. 4(1): 331 (1845). This was thought, by Hitchcock (1905) and some later authors, to be the first publication and to have post-dated the name A. borealis Hartman. The interpretation was followed by many authors, including Porsild (1957) (personal communication, Dr. J. McNeill, Director Emeritus, Royal Ontario Museum, 1995). Tzvelev (1976, 1983) suggested that within A. mertensii there is subsp. mertensis and subsp. borealis (Hartman) Tzvelev, and he provided the following key to distinguish them. In discussions with Dr. Tzvelev (Feb. 1999), he suggested that subsp. mertensii is Beringian and subsp. borealis has an Atlantic distribution in North America. This lead to the questions, (a) Can both species be recognised in North American material? and (b) If so, what is the distribution of the subspecies and what happens towards the middle of North America? To address these questions, Aiken examined 22 specimens, ranging in distribution from Alaska to Greenland, including Alaska 4, Yukon 2, central continental North America 7, Labrador 2, Arctic islands 3, and Greenland 4. In this limited sample, spikelet lengths ranged from 2.4 to 3.4 mm long. One northeastern Alaskan sample (CAN 327780) and one Yukon sample (CAN 31693) from within the area of Beringian distribution had spikelet lengths 2.8 and 2.5 mm long, respectively. These spikelets are shorter than the 3 mm, at least, expected for subsp. mertensii. No spikelets 3.5–4 mm long were found in the sample. To evaluate the lemma scabrosity character, each lemma was examined at 40×, with the lemma oriented towards the light source. This allowed the tiny scabrous trichomes to be seen. Five samples had glabrous lemmas, and 17 were seen as "entirely scabrous due to very short spinules or tubercules". This character was judged to be inconspicuous, difficult to apply, and probably not reliable. Lemma and callus lengths for the 22 samples were measured. The callus lengths were measured at 40× and calculated in millimetres. Lemma lengths ranged from 1.7 to 2.8 mm; callus lengths from 0.25 to 0.5 mm. Six specimens had lemmas 2.1–2.8 long, with a callus 0.4 mm long; 8 specimens had lemmas 1.8–2.5 mm long, with a callus 0.3 mm long, and 6 specimens had lemmas 1.8–2.5 mm long, with a callus 0.3 mm long. One lemma 2.5 mm long had a callus 0.25 mm, and another lemma 2 mm long had a callus 0.35 mm. These initial observations suggested a continuum in the length ranges. While the sample size is small, no way to reliably recognise more than one taxon in A. mertensii samples from North America was found using the characters suggested by Tzvelev (1983). In May 2002, Tzvelev agreed to drop the recognition of these subspecies in the Panarctic Flora Checklist (Elven et al. 2003). Illustrations. • Habitat. Plants on a densely vegetated slope. Culms approximately 10 cm tall with compressed pre-anthesis panicles. Nunavut, Baffin Island, Ogac Lake. 16 August, 1999. L.L. Consaul 2359, L.J. Gillespie and R.J. Soreng. CAN. • Herbarium specimen. Plants with diffuse open panicles. Nunavut, Baffin Island, Cormack Bay. 1989. Aiken 86–149. CAN. • Drawing. a. Full plant b. Close-up of spikelet with awn. Drawing from Porsild (1957). • Arctic Island Distribution.